INTERTANKO cargo tank cleanliness standards for chemical tankers implemented We believe that these standards will be adopted by the involved parties. We have now added these standards to the cargoes their cleaning recipes. A cleaning power expressed as Visually Clean, Water White, High Purity and Ultra High Purity has been defined for all recipes. The cleanliness requirement of all cargoes has subsequently been updated to the same classification. Although there are only very few cargoes asking for the Ultra High Purity Standard, some 1500 new recipes had to be added to the existing cargoes to explain our users how to achieve the new standard in case such a cargo has to be loaded. As of now MIRACLE works with the new INTERTANKO cleanliness Standards. Once a next cargo is selected the recipes with the required power are selected to satisfy the cleanliness requirement of the cargo to be loaded. We believe that these standards will be adopted by the involved parties. We have now implemented these standards. A cleaning power expressed as Visually Clean, Water White, High Purity and Ultra High Purity has been added to the recipes. The cleanliness requirement of the next cargo has subsequently been updated to the same classification. Once a next cargo is selected the recipes with the required power are selected to satisfy the cleanliness requirement of the cargo to be loaded. This slideshow explains more in detail how it works. MIRACLE cleaning recipes use cleaners from Chemtec Chemicals. If other cleaners are preferred, we support the selection of alternative cleaners with a tool that was now significantly improved. If a cargo requires cleaners, the integrated tool preselects now for each cargo a variety of appropriate alternative cleaners. MIRACLE Cleaning Plan linked to PPE Matrix in the Cleaning Seminar. At the end of the automatically composed tank cleaning plan is a selection of icons that can be tick-marked to specify the required Personal Protective Equipment (PPE). Certain equipment is a minimum requirement and thus already preselected. Additional required equipment depends on both, the hazards of the cargo and the hazards of the activity carried out. There is a link into our Cleanig Semnar that opens the PPE Matrix (see left picture). This Matrix helps the user to make the right decision. The MIRACLE Cleaning Seminar has now a comprehensive hazard register showing the potential risk of some 20 different cargo hazards types (e.g. flammable, reactive etc) and typical tank cleaning related activities such as tank entry. The potential risks are assessed by means of a 5*5 matrix. This register can be used as a basis for company specific risk assessments related to tank cleaning. 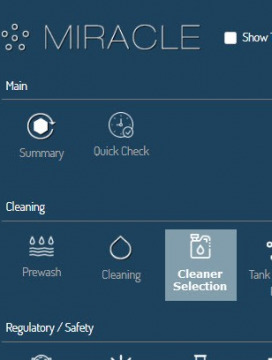 To navigate to this register go to MIRACLE Cleaning Seminar and select the Chapter Safety. Also a tutorial about Risk Assessment on the basis of 5*5 matrix is available now in the Cleaning Seminar. This is alsop integrated in the new MIRACLE ship board client 2019 version and can be used for on board training.